Kevin Weeks grew up in South Boston, a tough neighborhood where being able to handle yourself on the street was the most important thing. His ability to handle himself got noticed by James Bulger who ran the rackets, or mob in South Boston “Southie”. This is a first person account of his life and his experiences as an associate of “Whitey” Bulger. The shakedowns, the drug business, the murders, some committed by him, some witnessed by him and cleaned up after by him and some that he just knew about. Most of the time, they killed other criminals, some that were paying to be in business in their area, some that they felt couldn’t keep quiet about what happened, and some that were informants to the police. After Steve Flemmi was arrested and before Kevin was arrested Kevin found out that Whitey had been an FBI informant. This information changed his whole attitude about who he needed to be loyal to. It resulted in him cooperating with the authorities. This book is written in a very straightforward manner, like Kevin Weeks is sitting next to you having a conversation with you. The things he did are said very matter of fact, who they killed, why they killed. He appears to be remorseless, but this appears to be a coping mechanism. Since the people he killed were criminals, it was business and they knew the risks of doing business as criminals, he prefers not to dwell on the past. He regrets the time spent away from his children, and that his choices cost him his marriage. 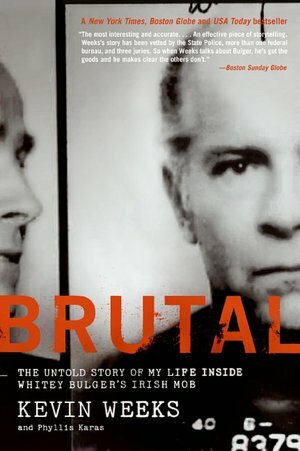 Posted by Belleza on November 1, 2012 in 2012, Memoir, Non-Fiction, True Crime and tagged eBooks, James "Whitey" Bulger, Kevin Weeks, Library Book, Really liked it ♥♡♥, Recommended to read, Stephen Flemmi.